Recent experiments (see Refs. [1,2] for an overview) on ion and electron bombardment of nanostructures demonstrate that irradiation can have beneficial effects on such targets and that electron or ion beams can serve as tools to change the morphology and tailor mechanical, electronic and even magnetic properties of various nanostructured materials. 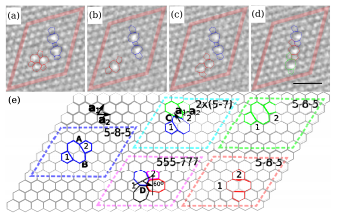 We systematically study irradiation effects in nanomaterilas, including two-dimensional (2D) systems like graphene and hexagonal boron-nitride (h-BN) sheets. By employing various atomistic models ranging from empirical potentials to time-dependent density functional theory we simulate collisions of energetic particles with 2D nanostructures and calculate the properties of the systems with the irradiation-induced defect. In this talk, our latest theoretical results on the response of graphene [3,4] and h-BN  to irradiation will be presented, combined with the experimental results obtained in collaboration with several groups. The electronic structure of defected graphene sheets with adsorbed transition metal atoms will be discussed, and possible avenues for tailoring the electronic and magnetic structure of graphene by irradiation-induced defects and impurities will be introduced. The effects of electron irradiation on boron-nitride sheets and nanotubes will also be touched upon. Finally, we will discuss  how electron irradiation and electron beam-assisted deposition can be used for engineering hybrid BN-C nanosystems by substituting B and N atoms with carbon with a high spatial resolution. A. V. Krasheninnikov and F. Banhart, Nature Materials, 6 (2007) 723. A.V. Krasheninnikov and K. Nordlund, Appl. Phys. Rev., 107 (2010) 071301. J. Kotakoski, A. V. Krasheninnikov, U, Kaiser, and J. Meyer, Phys. Rev. Lett. 106 (2011) 105505. J. Kotakoski, J. C. Meyer, S. Kurasch, D. Santos-Cottin, U. Kaiser and A. V. Krasheninnikov, Phys. Rev. B 83 (2011) 245420. J. Kotakoski, C. H. Jin, O. Lehtinen, K. Suenaga, and A. V. Krasheninnikov, Phys. Rev. B 82 (2010) 113404. N. Berseneva, A. V. Krasheninnikov, and R.M. Nieminen, Phys. Rev. Lett. (2011) in press.